Beschreibung: Im Notbetrieb l?uft zwar bei den Schildb?cks in Kaumberg noch alles, aber es l?uft. 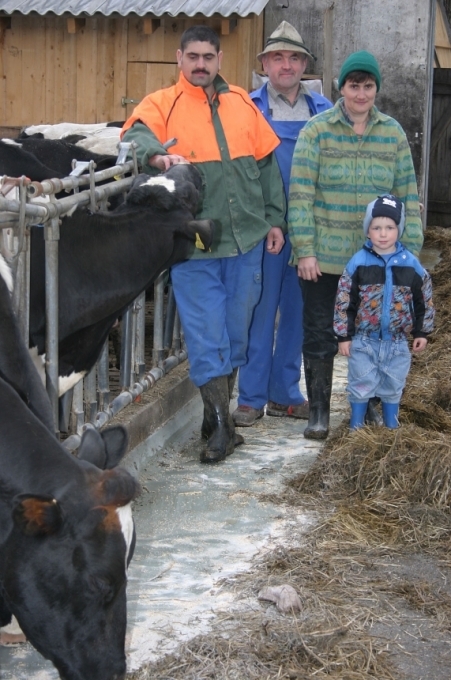 Der Bauernfamilie war durch den Schneedruck im Winter der Stall eingest?rzt, 5 Tiere verendeten. Durch die rasche Hilfe der Feuerwehr und zahlreicher Freiwilliger Helfer konnte fast der gesamte Viebstand gerettet werden. Die August Schildb?ck und sein Sohn Herbert planen bereits wieder den Neubau der Geb?ude. Jetzt da etwas Normalit?t zur?ckkehrt ist es der Familie ein Bed?rfnis allen zu danken die geholfen haben, sei es durch Mitarbeit, der Aufnahme von Vieh, Geldspenden oder Sachspenden. "Soviel Hilfsebreitschaft und Menschlickeit brachte in diesen dunklen Tagen und Wochen sehr viel Licht und Hoffnung in unsere Familie" w?rdigt August Schidlb?ck die Hilfe die ihm und seiner Familie zu teil geworden ist. It’s important that when you collect people’s email addresses you have to get their permission.Such a policy stance is crucial for China as it has to juggle the task of financial deleveraging, aimed at defusing risk and curbing asset bubbles, while shoring up the economy.Apart from the role of innovation and craftsman spirit, speakers attending this forum also put emphasis on supplyside structural reforms.S. SHANGHAI is the highest of five Chinese mainland cities at No.It is probable to have bursitis with other accidents of the shoulder,Manny Machado Jersey, like as tendonitis and muscle mass tears.They added that a strong yen,Steve Cishek Jersey, however, drags down exporter issues with a heavy exposure to overseas markets as they become less competitive and profits outlooks diminish and yields shrink when repatriated on unfavorable exchange rates.The eight elite men and will compete for a 150 000 prize purse (plus generous time bonuses),Gregor Blanco Jersey, with 40 000 dollars going to the race winners. 9 (Xinhua)The effects of the current outbreak of Ebola in West Africa and also the ongoing scare over the possibility of the disease spreading to Europe following the infection of a Spanish nursing auxiliary in Madrid have also affected the world of sport. It’s important that when you collect people’s email addresses you have to get their permission.? ?Asian cities made up half of the top 10, with Bangalore in India replacing London to take the top spot for the first time. LymanROME, 26 April (Xinhua)Entering his third month as prime minister, Italy's Matteo Renzi is starting to flex political muscle that makes analysts believe he could yield results with the ambitious reform agenda he laid out before becoming prime minister.